Cucumber melon, there's a bunch of recipes for it and this is mine. I really enjoy it in the summertime. A good sweet and refreshing vape. Nice, not a bad or offensive recipe by any means, but tastes like it’s missing something. Like it’s all soft, slightly syrupy sweet base flavors that play well together, without something on top to really hook me in to wanting to vape more of it. It’s like an excellent part of a recipe that’s not quite finished. 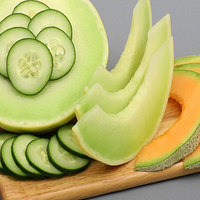 An easy route to something that tastes more complete would probably be something like adding just a little FA Cucumber, with that bit of green rind for more of a vegetal bite, or going the more melonious route and adding some FLV Wild Melon or something like that. And then there’s the possibility of going the more creative route, more creative than I am, and going for something completely different and contrasting against this complementary mix. I have a hard time tasting many flavors (strawberry and anything mixed with bakery ingredients) so I have yet to find a great ADV. I really enjoy this one and it could be one of my first ADV. I added a touch of menthol and love it. Thank you for this recipe!